Haden Salcombe Deep Teal Toaster. Featuring Extra Wide Slots. Colour: Deep Teal. Stainless Steel Sides. Delightfully elegant the Salcombe range will add a dash of colour to your kitchen. Coloured Plastic Front – Cool Touch. Each Breville toaster also has both defrost and reheat settings plus a cancel button. It’s the perfect blend of performance and panache. Removable crumb tray for easy cleaning. Removable crumb trays. The extra-wide slots with self-adjusting guides can handle thick bagels and artisan breads, and the high-lift lever puts everything easily in reach. Plus, the drop-down crumb tray makes cleanup easy and the integrated cord wrap simplifies storage. With 2 long slots to accommodate 4 slices of bread or 4 buns, this Cookworks stainless-steel toaster is perfect for the toast connoisseurs amongst us! Its high-lift feature protects your fingers when retrieving dainty crumpets and tiny tea cakes, and you can forget about bread blockages with its jam-proof tech! Has signs of use: scuff, scratches. 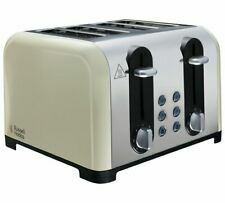 You are looking at a Used Dualit Classic 4 SLICE TOASTER, Made in England, Vintage Retro Design. The toaster is in great used condition with some minor signs of use and wear. The toaster is tested and works great. The toaster comes just as pictured. CTOV4003AZ, Azure Blue. - 4-SLICE toaster. Help keep the kitchen tidy with two removable crumb trays. ∙ Reheat function : ✓. ∙ Defrost function : ✓. ∙ Bagel buttons : ✓. ∙ Crumb tray : 2. CTZ4003BG, Champagne. De'Longhi Scultura 4-slice Toaster. ∙ Stylish Champagne high gloss finish. ∙ Reheat function:✓. ∙ Defrost function:✓. ∙ Bagel buttons:✓. ∙ Input power (W) : 1800. ∙ Slots : 4. Make breakfast for everyone with the Black and Decker TR1478BD Four-Slice Toaster. The extra-wide slots with self-adjusting guides can it thick bagels and artisan breads and the high-lift lever puts everything safely in reach. If you prefer toasted buns or bagels for breakfast but can’t fit the slices into your toaster, this 4 slice Wide Slot Toaster could be the answer. It’s 4 wide slots can accommodate thick slices of bread, crumpets, buns and bagels – so there’s no need to switch on the grill. You will receive exactly what is pictured. Tested & fully functional. Appears to have been used once or not at all. 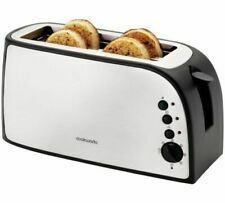 Haden Perth Stainless Steel Toaster. The Perth range is available in three stunning colours; Slate Grey, Cream and Stainless Steel as a kettle and a 4 slice toaster. Beautifully sophisticated the Perth sleek range will leave your kitchen looking super stylish. 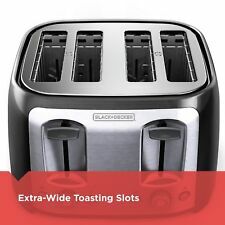 Cuisinart CPT-340 Hybrid Stainless Steel 4 Slice Toaster Six Setting Shade Dial. Condition is New. Shipped with USPS Priority Mail. Haden Cotswold Sage Toaster. Delightfully elegant the charming Cotswold range will add a dash of colour to your kitchen, available in three colours, Sage, Putty & White. It also has a self-centering function & a removable crumb tray. Haden Perth Grey Toaster. The Perth range is available in three stunning colours; Slate Grey, Cream and Stainless Steel as a kettle and a 4 slice toaster. Beautifully sophisticated the Perth sleek range will leave your kitchen looking super stylish. Cookworks 1500W 4 Slice Wide Slot Toaster - Stainless Steel/Black. Complete the look with the matching jug kettle - Breville VKJ864. Removable crumb tray for easy cleaning. 1 x 4 Slice Toaster. Variable width bread slots for thick and thin slices. Andis Lithium Titanium Foil Cordless Shaver. With 2400W replaceable elements & supported with a 5 year guarantee, your toaster is built to last. *Our electrical appliances are fitted with Australian electrical plugs designed to be operated on 220-240V, 50Hz power supply. You may use this product overseas by using an adaptor and may need a step down transformer. .
Delightfully elegant the Salcombe range will add a dash of colour to your kitchen. The Salcombe range is available in two stunning colours; deep teal & black with copper accents. It also has a removable crumb tray & cord storage. Wide slots with a variable width function. Cancel, defrost and reheat function. High-lift function for easy removal of smaller slices of bread. Independent slot operation. 7 toast shade settings from light to dark and 4 modes: bagel, frozen, cancel, and reheat. Auto-adjusting bread guides for even, consistent toasting; toast-lift lever for easy retrieval. Haden Salcombe 4-Slice Toaster - Deep Teal. Haden Salcombe Deep Teal Toaster. Beautifully sophisticated the Salcombe range will leave your kitchen looking super stylish. The Salcombe range is available in two stunning colours; deep teal & black with copper accents. Haden Salcombe Deep Teal 4 Slice Toaster. Delightfully elegant, the Salcombe range will add a dash of colour to your kitchen. 1 x Haden Salcombe Deep Teal 4 Slice Toaster. • 220-240V - 50/60Hz - 1150W. Wide slots can accommodate thicker slices. 2 Slide-out crumb trays in the bottom / back for crumb removal. Dualit's Classic four-slice toaster in Azure blue is the perfect blend of design and durability. 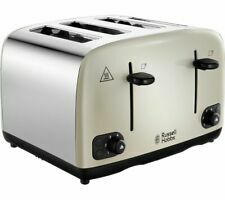 The Russell Hobbs Oslo toaster has a perfect modern look. With four wide slots which ideal for a thicker loaf, bagel and waffles. It has a cancel function which you can control your toasted food exactly what you want it. Approx. product dimensions: 28 x 27 x 19 cm. Item is otherwise complete with all accessories as you would expect from a new item. 12 MONTHS WARRANTY SUPPLIED. Removable crumb tray for easy cleaning. Defrost, reheat and mid-cycle cancel functions. Each toaster is hand-assembled from start to finish. Who made your toaster?. Hand built in the UK since the 1950's, the Classic Toaster has earned its place as a kitchen essential. Zone 1 - England, Wales and parts of Scotland, excluding Highlands and Islands. Type4-slice toaster. Removable crumb trayYes. Available in Cream, black and red colour. Cancel, defrost and reheat function. - Illuminated variable browning settings. Variable browningYes. Adjustable-width slotsYes. Haden Salcombe 4-Slice Toaster - Black & Copper. Haden Salcombe Black & Copper Toaster. Beautifully sophisticated the Salcombe range will leave your kitchen looking super stylish. The Salcombe range is available in two stunning colours; deep teal & black with copper accents. We all have it - that perfect shade we want our toast to pop out like. Whether you want it lightly done or nearly black, with this white Cookworks toaster, you can achieve that ideal level of toasty-ness, just to your liking! It incorporates a bagel and defrost function, extra-wide 36mm slots and automatic pop-up.1 x Dualit 46213. Model Number: 46213. The Lite toaster combines Dualit's classic toaster styling with a contemporary high gloss finish. This stainless-steel Cookworks toaster is the toast of the town. Okay, it's not actually but it's still pretty good! 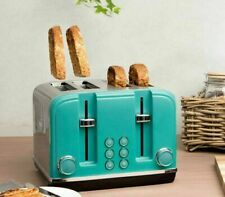 It has 4 slice slots, so there's enough for two (or maybe you just fancy 4 delicious slices of toast dripping in butter yourself?. ). Manufacturer Part Number: TR1478BD. Model: TR1478BD. Bagel Function - Put the perfect crisp on your morning bagel using the push-button bagel function. Make breakfast for the whole family with the BLACK DECKER 4-Slice Toaster. The toaster features 6 browning levels and a reheat function for frozen bread and bagels. No matter what your toasting needs and preferences - CRUX has you covered! ✅ BAGEL AND GLUTEN FREE SETTINGS: With separate settings for bagels and gluten free bread, you can get evenly toasted bread every single morning. NIB Cuisinart Touch To Toast Toaster Leverless 4-Slice LED Model CPT-440!